President Barack Obama has been officially sworn in for a second term, one for which he has mapped out an ambitious programme of economic, social and cultural change that includes new gun control legislation and long-sought immigration reform. 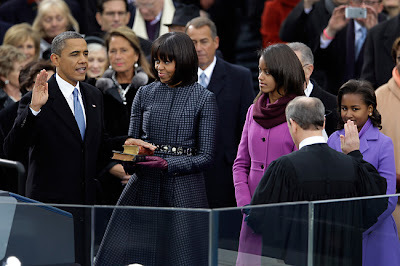 Smiling throughout, Obama delivered the oath in the Blue Room of the White House on Sunday with First Lady Michelle holding her family bible and their two daughters, Sasha and Malia, looking on. Afterwards, Obama kissed his wife and daughters, telling them: "I did it." It is not clear whether he was referring to having secured a second term or just having got through the swearing-in without incident. Second-term presidencies are often lame ducks, suffering from burnout and complacency. But Obama hopes to use the next four years to establish a legacy that goes beyond just being the first African-American presidency. Although most of the inaugural events are scheduled for Monday, the start of his presidency officially began on Sunday at midday. Chief Justice John Roberts administered the oath of office and succeeded in getting through it without incident, compared with the embarrassment of 2009 when he mangled the words, forcing the event to be done again. Speaking just before the swearing-in ceremony, one of Obama's main White House advisers, Valerie Jarrett, who has been part of his team since his days in Chicago, denied there was any sense of weariness creeping into the White House. She told CNN that Obama, having won re-election in November, appeared more confident now. "He is as energised as I have ever seen him... I don't think burn-out is going to be a problem," Jarrett said. Obama is putting his new cabinet together, with his proposed secretary of state, John Kerry, due to begin Senate nomination hearings on Thursday and his proposed defence secretary, Chuck Hagel, set to follow at the end of the month. 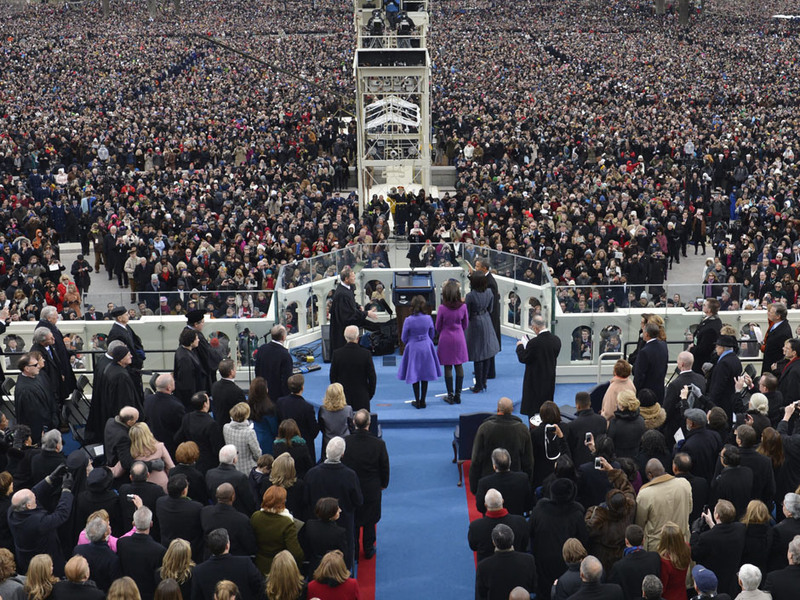 The swearing-in ceremony was televised, in part to avoid the confusion of 2009 that started a number of conspiracy theories about whether Obama was in fact the president. After Roberts mangled the oath, there was a quick, private ceremony at the White House with no television footage. This time round, the ceremony was broadcast nationally. 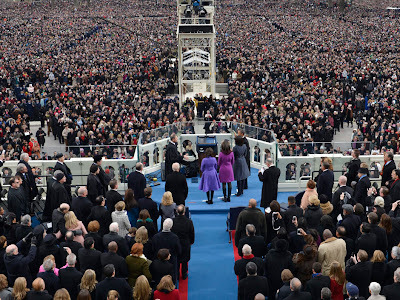 The main public events will be held on Monday, with Obama being sworn in again at noon, on the steps of Congress and in front of a crowd expected to be between 500,000 to 800,000 packed onto the Mall. The size of the crowd holds up well against turnout for previous presidents, but it will be well down on the record 1.8 million who turned out for Obama in 2009. Hours earlier, the vice-president, Joe Biden, was sworn in at his official residency, the Naval Observatory, about 15 minutes drive from the White House. Biden, whose reputation has risen in DC after he negotiated a deal that ended the "fiscal cliff" showdown with Congress at New Year, is reportedly considering a run for the presidency in 2016, possibly against Hillary Clinton, the outgoing secretary of state, for the Democratic nomination. The inclusion of guests from some of the key primary states at Biden's swearing-in ceremony added to the speculation that he will run. Obama's first big challenge looks like being the necessity of dealing with Republicans in the House of Representatives, with a potential series of economic clashes looming that could wreck his second term plans. But Obama secured an early victory when Republican leaders, at a retreat in Virginia to discuss post-election strategy, appeared to back down over a threat to close the federal government over raising the debt limit. Apart from the Republicans, Obama in his second term hopes to see embedded the biggest change of his first term, the expansion of healthcare coverage which was passed in 2010 but is not due to kick in until 2014. Almost all obstacles, from Republican governors to the Supreme Court, have been overcome. On gun control, the president may only be able to get through Congress tightened background checks for buyers, rather than an automatic-weapons ban. But Obama is looking to the long-term, initiating a national debate on gun violence. On the foreign affairs front, the biggest challenge appears to negotiating a deal with Iran on the nuclear issue, pulling most US combat troops out of Afghanistan and, possibly, trying to resolve the Israeli-Palestinian conflict. Ross Baker, a politics professor at Rutgers, said Obama had already done enough to achieve inclusion on the list of great presidents – not up with the great greats, such as Abraham Lincoln or Franklin Delano Roosevelt, but in the second tier, better than John Kennedy or Bill Clinton. "He will strive to rekindle the excitement of the first term which is a difficult objective to achieve," Baker said. "His first term is a difficult act to follow. I could not imagine anything of the magnitude of Obamacare or Dodd-Frank [the legislation on financial regulation]. He would do well to get over the debt/spending obstacles with his dignity intact."